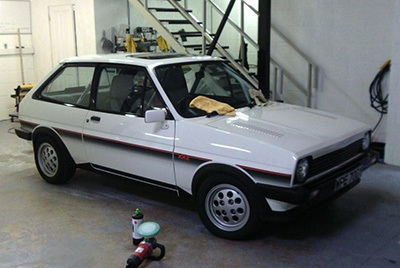 Here Passfield Panel & Paint, we are a team of specialist technicians experienced in repairing and restoring damaged vehicles based in Dunstable, Bedfordshire. Our technicians are fully qualified Mercedes painters who have more than 22 years experience in car spraying and painting. Our extended experience ensures you can have full confidence when using our vehicle body repair and restoration service knowing we can return your damaged vehicle to it's original state. Our services range from body repairs to car spraying and alloy wheel refurbishment. We're a small and friendly team with a wealth of experience and knowledge to ensure that every vehicle that leaves our garage is in complete pristine condition. There are also a number of other services that we are able to complete. We are happy to take on any task no matter the size from a full polishing service to bumper scuff repair and a full crash repair service. Our vehicle body repair garage in Dunstable is open Monday to Friday 8:00 - 16:00 and Saturday 8:30 - 12:30. Drop by our garage for a free quote. Our ethos is to deliver a service that is second to none in the Dunstable area whilst offering you a flexible and affordable vehicle body repair service. For all enquiries please contact us on 01582-968-498 or send us a message online using our enquiries form.